After 6,000 years of human civilization, it’s come to this: A finely detailed, life-sized ice sculpture of rapper/actor Ice-T will slowly melt, drip-drip-drip, during a live internet event. When its microphone falls the to floor, it will make winners of some lucky Sonic Drive-In fans. Goodby Silverstein & Partners came up with the chill stunt, which will stream Tuesday on Facebook at 1 p.m. ET. 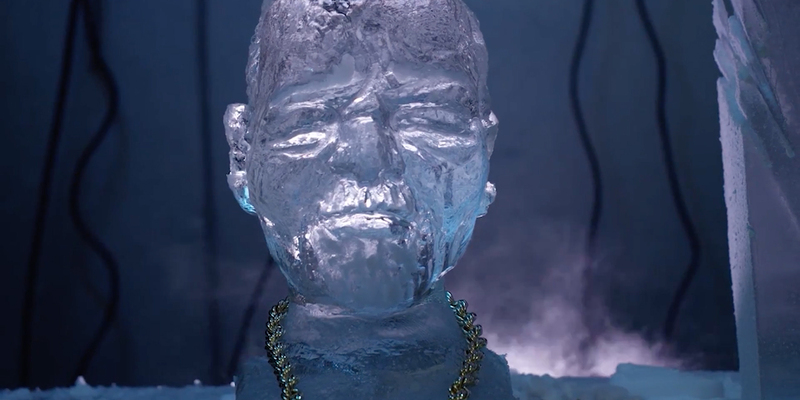 The sculpture, made by David Fong of Ice Illusions in Santa Clara, Calif., will be holding a real mic, and once it drops, the first 100 users to comment will receive a limited-edition Ice-T T-shirt that changes color when frozen. The Ice Man cometh, during National Iced-Tea Month, to promote Sonic’s menu of frozen teas, because that’s the way he rolls. Speaking of time, how long might it take for that mic to drop? Sculpted from four massive blocks of ice, the 6-foot-tall, 600-pound figure will melt down on the agency’s San Francisco rooftop. It should be sunny and near 70 tomorrow in the City by the Bay, so that microphone could be falling fast.